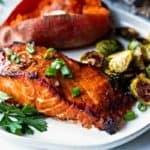 This BEST Grilled Salmon recipe has a slightly sweet and smoky flavor and is grilled to perfection in just around 15 minutes! During cooking, the marinade creates a nice glaze and the salmon filets end up with a slightly crisp outside and light flakiness inside. 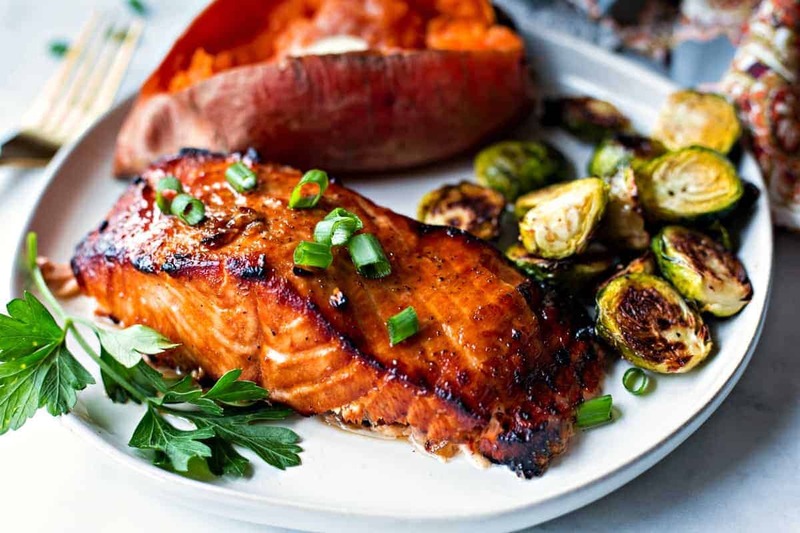 This simple grilled salmon is not only delicious, but it is extremely easy to prepare. The marinade is mixed up right in a ziplock bag and the fish is grilled in little aluminum boats making clean up equally as easy! My family agrees that this is the best grilled salmon recipe ever, and I think yours will, too! Grilling is practically a year-round thing at our house. Early Spring until late Fall, you’ll find John flipping burgers, chops, steaks—well, just about anything, really—at least two or three times a week. Lately, we’ve been adding this recipe for slightly sweet and smoky Best Grilled Salmon to our regular grilling rotation. What’s surprising about that is that John believed that he didn’t like salmon until we tried this recipe! That’s a big win for me because I love salmon and now he’s the one who suggests we pick up salmon for the grill…happy wife, happy life! We first made this recipe over two years ago (thanks to Honey Bear Lane for the original post!) and my family whole-heartedly agrees that this truly is the BEST salmon they’ve ever eaten. That’s quite the compliment, especially coming from my hubby who thought that he didn’t like salmon. Who knew that after 30-plus years of marriage I could finally convince him to grill salmon? And guess what? He loves salmon now! In fact, it’s usually John who suggests grilling salmon for dinner—haha! 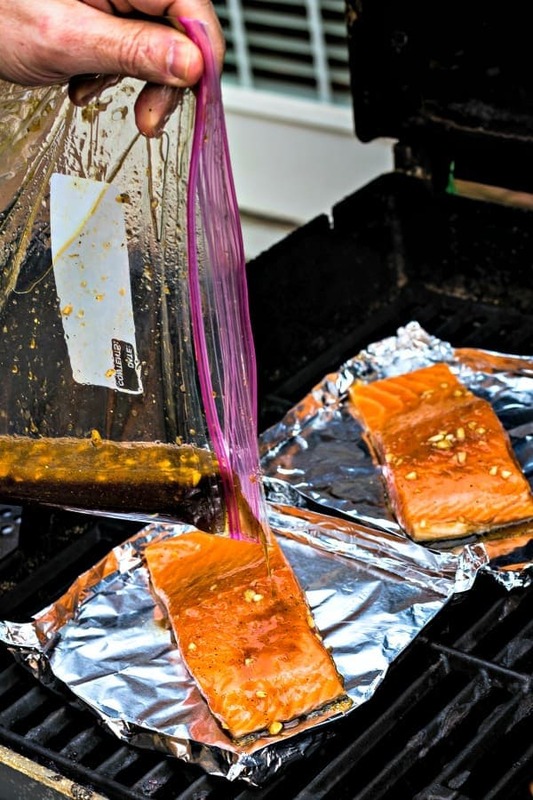 Best Grilled Salmon marinates in ziplock bag for easy clean-up! 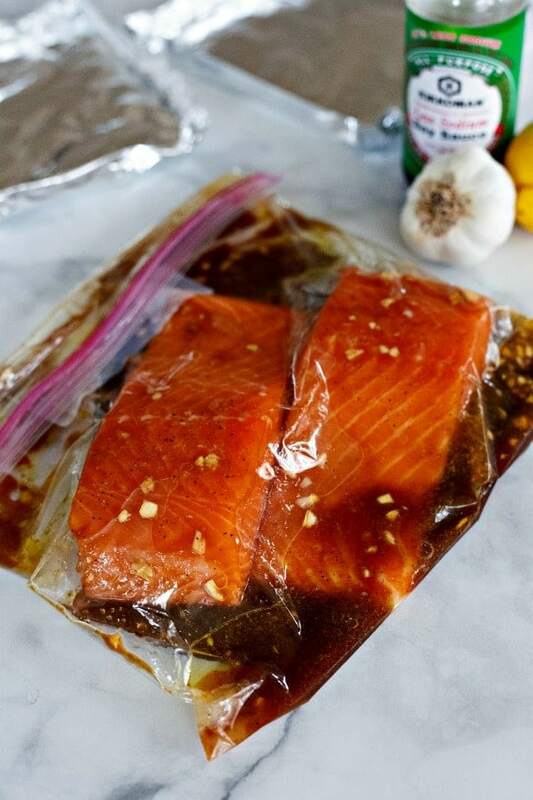 Start by combining the grilled salmon marinade ingredients in a single gallon-size zip lock bag (no need to dirty up a bowl), add the salmon, and refrigerate for at least an hour to allow the flavors to penetrate the fish. After soaking up all that flavorful marinade, the salmon fillets are grilled in little aluminum foil “boats”. I use heavy duty non-stick aluminum foil and just fold up the sides a couple of times to make a lip. Place the filets on the foil skin side down, then pour some of the marinade over the top. The best part is that after grilling, you just toss the foil! The salmon is perfectly cooked after just 15-18 minutes on the grill with the lid down. Be careful that you avoid overcooking or the salmon will become too dry. The salmon should lift away from the skin easily with a flat spatula. This really is the best way to grill salmon! I seriously can’t even count how many times we’ve used this recipe to grill salmon. The marinade is so flavorful, the salmon is tender and flaky, and clean up is a breeze. This recipe is always a winner with our crowd! 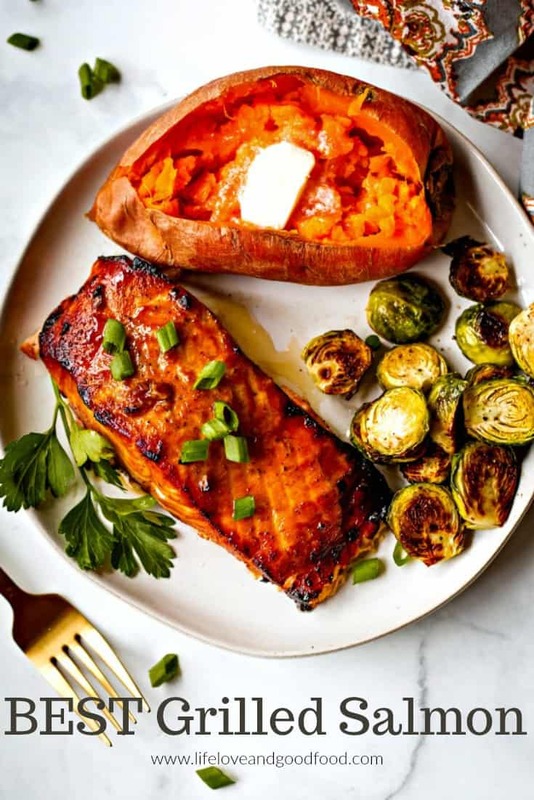 For a simple yet delicious meal, I like to serve this healthy grilled salmon with a baked sweet potato and 20-minute oven roasted Brussels sprouts or a side of steamed broccoli. This recipe has become one of our go-to options because it is so easy and so tasty! Did you make this Best Grilled Salmon recipe? Let’s get social! Follow me on YouTube, Pinterest, Instagram, Facebook, and Twitter! Perfectly grilled salmon with a slightly sweet and smoky flavor. Place all marinade ingredients into a gallon size zip lock bag and seal. Squeeze gently to combine ingredients, then add salmon fillets. Seal and refrigerate for 1 to 3 hours to allow flavors to penetrate the fish. Preheat grill to medium high heat. For each salmon fillet, take a piece of heavy duty aluminum foil and fold into a "dish" with sides. Place a salmon fillet into each dish skin side down. Add a little of the marinade on top and place the entire dish on the grill. Grill for 15-18 minutes with the lid closed. Flip the salmon onto the grill to sear the top, about 1-2 minutes. Carefully scrape off the skin (it should lift right off) and serve. Can you grill salmon without the skin? Would you just shorten the cooking time? Hi, Paula. You can grill the salmon without the skin, but I think leaving it on helps to hold the fish together. Adjust cooking times, with or without the skin, depending on your preference for the fish temperature/doneness. I always test with a fork to make sure it flakes easily. 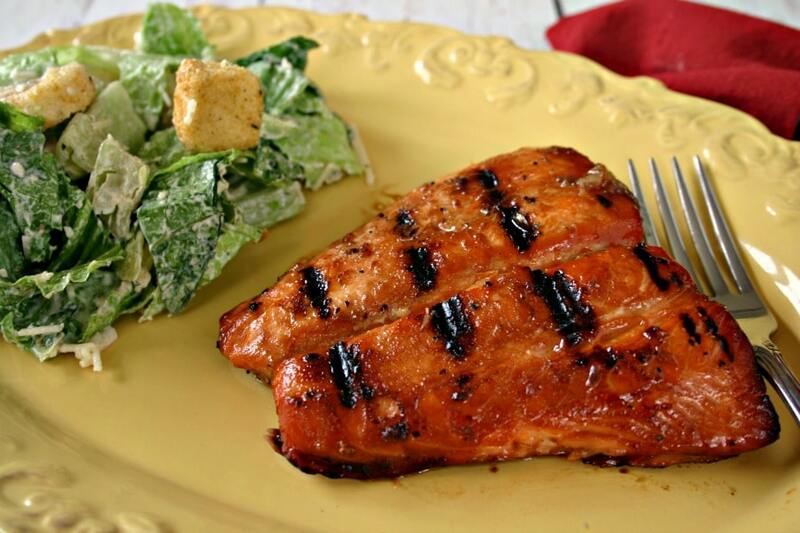 This marinade makes delicious grilled salmon. I grill the salmon pieces directly on the grill, skin side down for 18 minutes. Flip it. Pour marinade over it and grill it for 2 minutes more. Thank you for sharing your recipe. So glad you loved the salmon! Could you bake the salmon and turn on the broiler at the end to “sear” the top? If so, what temperature would you bake it and how long? Terri, I would try baking the salmon at 425 – 450 degrees for 12-15 minutes and very carefully turn on the broiler at the end of cooking, but personally I think grilling is best. Hi! My husband also loved this, thanks! I was hoping for it to turn out with more of a glaze on it… it was still great, but any advice to help achieve that? Thanks! Hi, Kate. Because of this cooking method, I think it would be difficult to get a really thick glaze going on. You could try preparing a little extra marinade to use as a basting sauce. Brush it on just before you flip the salmon during the last step when you sear the fish. Let me know if you try that – thanks! When placing the salmon into the foil “dish” what side goes down? Skin side or the fish side? Rose, it starts out with the skin side down. Enjoy! Delicious! We loved the salmon tonight! Suzy, I am so glad you did! I just tried this recipe but instead I baked it for 13 mins and then grilled them on medium/high heat for 40-50 secs using a grill pan It was AWESOME! That’s a great indoor solution! Thanks for sharing. We just tried this recipe. We subbed coconut aminos in place of soy. It came out perfect. Best i have done so far. Thank you for posting your recipe. Best grilled salmon I’ve ever had! Family loved it!! Oh my! So good! Made extra marinade reduced it, and served it on the side! Wow! Could you leave the salmon to marinating all day while at work? Brandi, with fish it’s not necessary to marinate all day. If time after work is an issue, it would be ok to reduce the marinating to just 30 minutes instead. Thank you! I am going to fix this tomorrow evening! We love salmon and are always wanting to try new recipes! This was really good! We make salmon often and I’ve used a soy-maple marinade in the past, but really liked this combination of soy-brown sugar-lemon. Will use again. We grilled this time but we bake often. I used a dark soy sauce and didn’t add salt. This salmon recipe is by far the best I’ve had! 5 stars for sure! Me and my wife are in love with this salmon recipe. We can’t have it any other way now! My daughter even loves it and she has never been that much of a salmon lover. Thanks for the recipe! If using frozen salmon, can it “thaw out” in this marinade for the last couple of hours? Thanks so much! Hi Debbie. I haven’t tried thawing the salmon in the marinade before, so I can’t be positive on what results you will get. That being said, it makes sense to me that this would work. This is my FAVORITE marinade for salmon! I’d rather stay home and make this than pay for salmon at a restaurant with this recipe. Bookmarked! Wow… I have bookmarked your page and will try it on the weekend. Thanks for your recipe. I like salmon and love how it serves with sweet potato on your recipe., I’ll make this.